Our 4R-5 4-string J Bass takes the best features of the models we all love and serves them up in a rear-routed pickup orientation, with no pickguard to conceal the beauty of the wood. We use the 1970s bridge pickup location for added punch and have worked closely with Artisan Guitar Electronics to formulate the ideal pickups for great bottom end, J growl and strong mid-range. Bookmatched figured-wood top – We have access to a variety of reclaimed and salvaged species of tonewoods that make incredible bookmatched tops, including redwood, mahogany, walnut, pistachio, and port orford cedar. Fretless – We’re happy to make your bass a lined or un-lined fretless and can use passive or active electronics to shape your tone. StoryWood basses benefit from a higher-mass, upgraded bridge. The natural sustain of the reclaimed body and neck wood coupled with an upgraded bridge yields increased dynamic range, sustain, and pitch stability as well as increased string vibration transference from the vibrating string to the body. 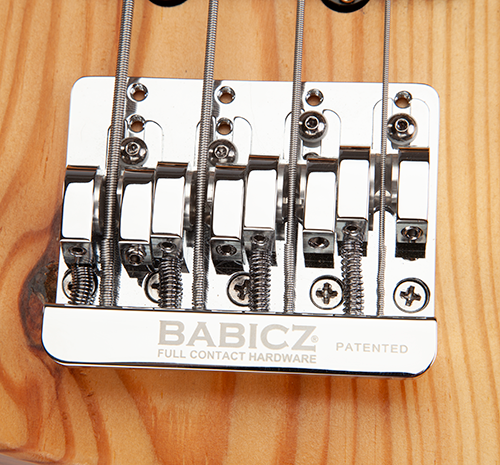 StoryWood recommends either the Babicz Full Contact bridge (pictured at left) or Hipshot bridge. During a long gig, instrument weight can be an issue. And neck dive is a nightmare. We use Hipshot ultra-light clover-peg tuners on our StoryWood basses for performance as well as weight reduction. They hold tune very well, have smooth gearing and look amazing. While we have access to your favorite pickups from a variety of manufacturers, we are fortunate to have a top-notch pickup guru in our backyard here in Raleigh, NC. We have worked closely with Artisan Guitar Electronics on most of our instruments, and their J Bass pickup recipe produces great bottom end, J growl and mid-range punch. The magnets are staggered to match the radius of the fretboard as well for a more even output. Passive or active pickup systems are available to suit your needs.